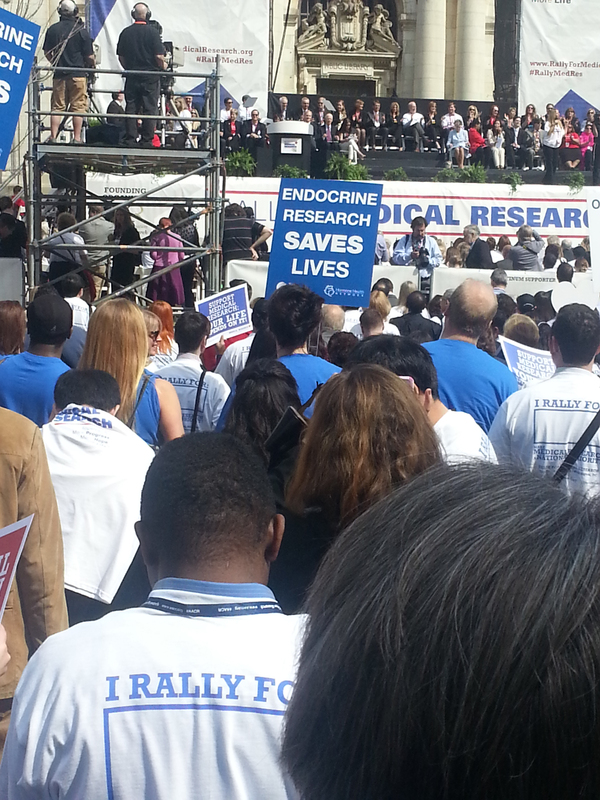 Speakers are getting the crowd excited at AACR’s Rally for Medical Research. Heard chanting: More progress, more hope, more life. Many of the 18,000 attendees at this year’s American Association for Cancer Research Conference in Washington, DC, attended the “Rally for Medical Research.” Nearly 200 partnering organizations were involved. Many believe this is the largest number of scientists in the medical research community to ever come together in such a public way to express support for the NIH. This unified call to action will raise awareness about the critical need for a sustained investment in the NIH to improve health, spur more progress, inspire more hope, and save more lives, according to rally organizers. Brian Boucher, whose daughter was diagnosed with a unique type of acute lymphoblastic leukemia at 15-months old, took the podium and noted that if this had happened in 1962 his daughter probably would have died. But Boucher served as her donor for a bone marrow transplant at St. Jude’s Children’s Research and she is fine now. Her outcome was largely due to funded research that led to this type of medical treatment, he pointed out. Marc Trevor Tessier-Lavigne, Ph.D., is a neuroscientist who is president of The Rockefeller University in New York City, followed Boucher. He once served as the chief scientific officer at Genentech. He also sees the funding cuts to NIH research as destructive. But he added another perspective to the funding problem.